There’s a button on the tailgate of the 2019 Chevrolet Silverado that, when pushed, slowly lowers it to the open position. Big deal — that’s Detroit innovation, circa 2015. Push it again, however, and the gate closes itself. We’re in the later stages of evolution when it comes to the genus pickup, and the margins for improvement have grown slim. Chevrolet’s new half-ton moneymaker offers a smattering of Easter eggs to stand out, if just a bit, from rivals. The corner steps in the rear bumper are a little wider. A driver can check the trailer-hitch camera while traveling to make sure the load isn’t miles behind. And then there’s the robot tailgate, which you won’t find on any F-150 — at least, not yet. 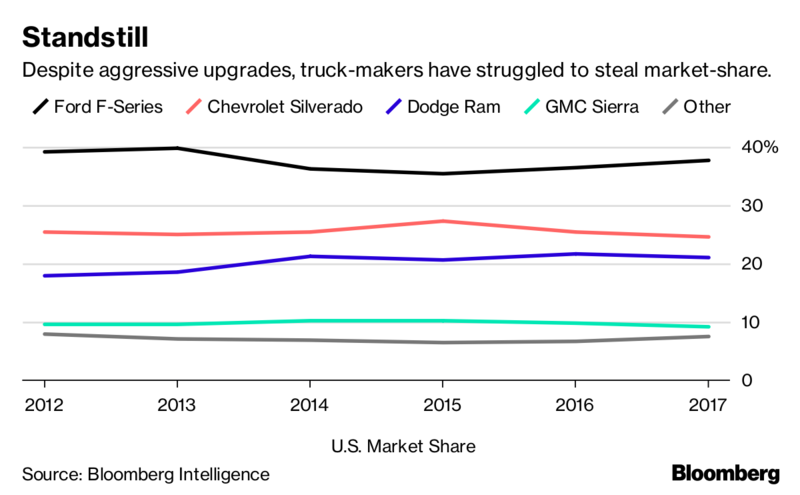 Here’s the dirty little secret about the Ford-versus-Chevy pickup truck slugfest: Both companies make great rigs. They are Motor City’s ultimate cash crop, and as such get all the greatest resources — the best designers, most talented engineers and biggest research and development budgets. Which one is better? It’s tough to say and frankly, it doesn’t matter. At this point in the game, the prospect of any player increasing their slice of the pickup pie—“conquesting” in industry-speak—is slim. Moreover, it would be a flawed strategy, given that a huge swath of Americans is clamoring for a pickup (whether they actually need one or not). The pie, in other words, is growing fast. And it’s not just middle-aged men looking to telegraph a blue-collar image. The valedictorian of my high school class, who went on to Harvard and a lucrative investment banking career in Boston, recently swapped his Audi for an F-150. On weekends, he packs the kids up and takes them skiing in Vermont while the Range Rover sleeps in Back Bay. This guy is the paragon consumer for Detroit’s savviest executives. They aren’t focused on changing the mind of die-hard “truck guys.” Rather, they’re out to lure the millions of “pickup-curious” out there. “We’re focused on serving customers, instead of chasing the competition,” explained Todd Eckert, head honcho of Ford’s truck marketing. It’s a simple numbers game. Here’s a look at how market share for half-ton pickups has changed over time. And here’s a look at sales volume by brand. Forget all the jingoistic, chest-thumping ads at halftime: There isn’t a champion, because everybody is winning. 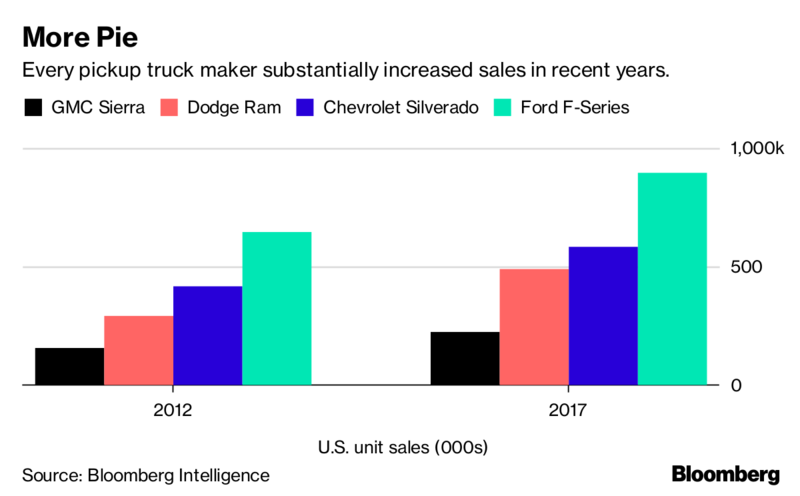 Over the past five years, the U.S. full-sized pickup market has grown by 45 per cent. From that perspective, the new Silverado doesn’t have to be the best pickup. It just has to be good enough to get its share of newbies. This is why the rig comes in eight trims, with a Texas-sized price range. Starting around US$29,000, it can run as high as a down payment on the house: Check all the boxes on the build sheet, and the price of a Silverado will stretch north of US$70,000. “We’ve got a truck for everybody,” Silverado marketing chief Hugh Milne said. Every version can be kitted out with an off-road package, including skid plates, a heavy-duty air filter and stronger shocks. The new Silverado is also two inches longer — space allocated for backseat leg-room — and quite a bit more handsome. Chevrolet scrapped the rectangular stamp of the truck’s wheel-wells in favor of a sinuous line that slashes from headlight through the door panel. It gives the squared-jaw face a high cheekbone and whoever is responsible for it deserves a raise, Mary Barra. There are six engines to choose among, the smallest of which is more than capable. Goosing it from 10 mph to 75 mph along a New Jersey on ramp, the truck felt as eager as a small crossover. Once up to speed, Chevrolet engine wizards start working their mileage magic. The new Silverado is among the first vehicles to have GM’s new “Dynamic Skip Fire” system, which essentially shuts down cylinders that aren’t needed. Coasting downhill on an interstate, only two Silverado spark-plugs will be firing. A more aerodynamic windshield should also help out at the gas station, too. Inside are plenty of cubbies to store farmer’s market produce, including two behind the rear seats. Meanwhile, the center console and dash offer about six places to nest a super-sized smartphone. In 2019, iPhone trays are the new cupholders. And the Wi-Fi is quick and reliable, which has become a GM trademark. So yes, the Silverado does the city well. But how does it handle the back forty? If anything, a little too well. Deep inside a gnarly mud pen at New York’s Monticello Raceway, Chevy strategy reveals a major flaw: Its best-selling vehicle is overbuilt. Maybe one out of 100 Silverado customers will require this level of off-road chops, but still. In the stickiest, swampiest spots, the wheels spun helplessly for a few seconds before — thunk — the rear differential locked and the truck crawled off like a minivan headed to Costco. Chevy engineers also spent a lot of time in the bed, adding tie-down points, wiring new LED lights, and nipping, tucking and stamping metal until the whole bin was seven inches wider. The truck will now fit a standard sheet of plywood on top of the wheel wells, providing a two-layered system of storage for DIYers with an OCD streak. It’s the kind of pragmatic tweak that has made contemporary pickups so good. No one was really asking for an in-bed layer cake of gear—and pickup trucks are more cultural artifact than utility these days—but they’re going to like it. Meanwhile, a few dozen designers in Detroit justified their salaries for another year. What’s most critical for truck-makers isn’t really towing power anymore; rather pricing power. On a great truck, Chevy pockets about US$10,000 profit for each sale. On a slightly less-great truck, that figure might fall to US$8,500 as the company is forced to roll out incentives. In the course of a typical year, that distinction adds up to almost US$1 billion (with a “b”) for Chevy. This, in short, is why the little things matter so much. To be sure, Ford has plenty of its own party tricks that one won’t find in a Chevy: a tiny, 4-cylinder engine (for which about one-third of buyers opt), a 10-speed transmission, a giant moon-roof and a drive-by-knob system that helps trailer rookies back their boats into the bay of the garage without taking out a wall. For those who seldom leave the interstate, the Silverado is a pleasant machine, though it has other shortcomings that may disappoint the Audi crowd, in addition to being a little unwieldy to park. The largest of the optional touchscreens in its pricey High Country iteration would look small in a little SUV, let alone a half-ton truck. The seats won’t massage like a Volvo, and there’s no atomizing scent in the glove box to mist over a stale dog, as the thoughtful folks at Mercedes provide. And no, the Silverado won’t drive itself, not even a little bit. “I don’t think anyone has really figured out how high the top end of the market is here,” Milne conceded. No sweat, there’s always next year. In the meantime, that robot tailgate will be a big hit.